After reading Everyday Asperger’s blog post here about the MTHFR gene and methylfolate I got in the car almost immediately afterwards and drove to the late night supermarket to hunt for methylfolate. Being a supplement I thought I had a slight chance of it being available. No luck. Only folic acid. We then went further afield and looked for the all night pharmacy. We drove past it but couldn’t see it as it was too dark. We took a chance and drove to another pharmacy that we thought might be 24 hours open. It wasn’t. Although a disappointing result I felt victorious. I had taken action to find something to aid in my combat tool kit for depression and general mental health. Day 2 in the search was little better. The first pharmacy said no immediately but recommended another pharmacy down the road. We wandered a little further. No stock but they could order it from the States. I got their contact number and said I would call if i didn’t have any luck. By this time I was tired of looking. It was suggested to me that calling ahead might be a better use of time. A sensible suggestion. But sometimes you just want to run around like a headless chook. Day 3 I called back the pharmacy and ordered methylfolate (Metafolin). I was in a pharmacy, another one and asked about methylfolate. The pharmacist there hadn’t heard of it, but she showed curiosity and a willingness to learn. She said she would look it up and I also mentioned the MTHFR gene too. She initially thought I was looking for folic acid but I said no, not everyone can absorb it. I am very surprised at the lack of access to methylfolate. I cannot wait to try it and see if it helps me. I am very hopeful. The order arrived four days later. I got a phone call from the pharmacy I was in the car in time before it closed for the day. I feel like my head is clear and I have more energy and want to be active. I feel brighter. The difference after taking methylfolate (Metafolin) is dramatic. At the same time I am slowly improving my diet and eating more vegetables especially ones rich in minerals and vitamins. I have self diagnosed this need for folate. If I want to confirm that I do in fact have a mutant MTHFR gene then I can order a gene kit. See below if you want to find out more about your DNA. For detailed information go to Genetics Home Reference. What is Folate or Methylfolate? Is it the same as Folic Acid? ‘Folate is Vitamin B9 and is NOT the same as folic acid. (Folic acid is synthetic and is not found in nature. )‘* See the number of transformations that folic acid must go through in order to be useful to the body. 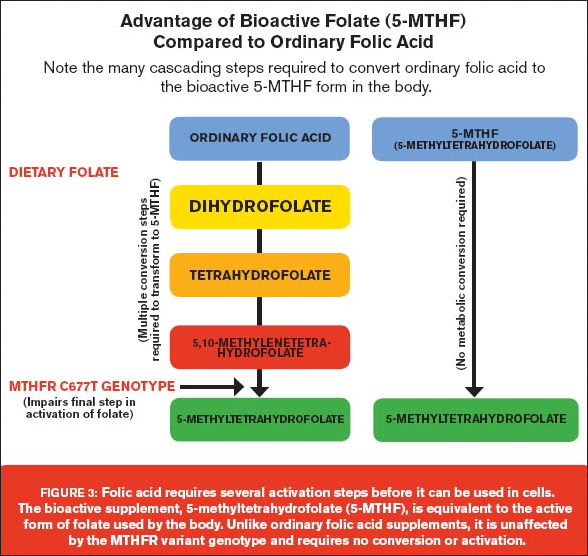 However if you have a mutant MTHFR gene then folic acid supplements won’t ever help. Folate supplements on the other hand can be absorbed into your body right away without the need to transform into something else before being useful. 800mcg folate is recommended daily. You might see results with 400mcg folate. To check whether you have a mutant MTHFR gene you can order a DNA Kit from 23and Me. Cost is US$99. You send them a sample of saliva and they return a printout of raw genetic data. You will not find out about future health issues or your likely time of departure. Given that these DNA differences are so common, it probably should come as no surprise that scientists are starting to rethink their effects on health. In fact, the American College of Medical Genetics and Genomics (ACMG) released a statement in early 2013 that in most cases there is not a medical reason to be tested for the C667T and A1298C variants of MTHFR. The reason they came to this conclusion is that accumulating evidence seems to show no difference in risk for disease in people in the United States with and without the C667T and A1298C polymorphisms. In fact, the A1298C does not appear to affect the gene function at all. Keep in mind, though, that this is still an active area of research and none of this is definitive yet. The best recommendation is to consult a genetic counselor before and after getting a genetic test. From what I have read the gene polymorphism of the MTHFR creates numerous medical issues for people from infertility to depression to MS. It makes me question why women are encouraged to add folic acid to their diets to increase their chances of getting pregnant, it may just be hindering. Even commercially made bread is laced with folic acid. So glad to hear that the effects have been good; hope the improvement continues. Folic acid is given to pregnant woman to prevent spina bifida in the fetus. It reduces SB by about 70%. Ah. So that’s why. Wouldn’t folate do the same? This is what I found: 3) Human exposure to folic acid was non-existent until its chemical synthesis in 1943, and was introduced as a mandatory food fortification in 1998. (4) Food fortification was deemed mandatory due to overwhelming evidence for the protective effect of folic acid supplementation before conception and during early pregnancy on the development of neural tube defects (NTD) in newborns. Folate is the natural form. Excessive intake of folic acid may cause health problems, which is why it’s indicated for pregnant women, but not everyone. Unfortunately folic acid is added to much of our food, so everyone gets it, not just pregnant women. It’s one more choice taken away from the consumer. I make my own bread. So that avenue is blocked successfully unless I get lazy. I wonder what other foods its in where I live? Thanks for the detail of folic acid. Appreciated. Additionally, commercially available grain-based products that line grocery store shelves and are served at restaurants are unhealthy. They are full of ingredients that are not food, like azodicarbonamide (the same chemical in yoga mats and shoe rubber), other chemical dough conditioners, added sugars, artificial flavorings or coloring and GMOs. Flour can be treated with any of the 60 different chemicals approved by the FDA before it ends up on store shelves – including chemical bleach! Also, the industrial processing destroys nutrients, such as Vitamin E and fiber. “In New Zealand, the milling extraction rate of wheat grain for white bread is much higher than in the USA. The New Zealand extraction rate is 78% compared with a rate of less than 75% in the USA. A higher milling extraction rate means that higher levels of nutrients (B vitamins, protein and carbohydrate) are retained in New Zealand bread. Therefore it is not necessary to add synthetic vitamins and minerals into New Zealand bread as occurs in the USA and UK. Azodicarbonamide is a banned food additive in New Zealand. Wow! I’m glad New Zealand cares about its people. New Zealand is too heavy handed when it comes to pesticides though. We still have much to learn. The ranking of the other foods on the dirty dozen list isn’t necessarily very accurate because of the small number in each sample. Bread and wheat products are at the top of the list, with residues detected in 94.4% of 90 samples. Wheat products include bran cereal, biscuits, flour, noodles, spaghetti, wheatbix, cake, pizza, sausages, luncheon sausage, muesli, hamburger, meat pie and the batter around fish. The chances are you are also taking in organophosphate or insecticide residues most of the time you eat something with flour in it. Most of these residues result from the post harvest application of a fumigant on the stored grain (chlorpyrifos methyl, pirimiphos-methyl, piperonyl butoxide, fenitrothion,). The level of these insecticides does not seem to have decreased overall since the Total Diet Survey in 1990/91, even though NZ’s residues are much higher than either the UK or US. The US had residues in 27% of wheat and wheat products, in contrast to New Zealand’s 94%, for example! Other countries are increasingly using non-pesticide means of storage for their grain, for example, cold storage or carbon dioxide. What’s so alarming is that even if you tell people that the government permits food producers to poison consumers, they either believe it’s okay, or don’t care. The U.S. government has come up with a system of labels that allow growers and producers to lie about how the food was produced and how it’s processed. I bought eggs labeled ‘brown organic eggs’ – they were dyed brown; the color washed off when I boiled them. I think it’s because you can’t see it, you can’t feel the impact of the real dangers. Radiation, poisons, pesticides in small doses don’t appear to cause damage visibly quickly so the fear is not there. LOL “brown organic eggs”. That’s appalling! I hope it was organic dye! How stupid do they think people are? Obviously no repeat customers. I haven’t come across that here. I am wary of the labels for organic. For example seaweed is labelled organic or isn’t mentioned. Naturally the organic seaweed is priced higher. All seaweed is organic. Sure if you harvest it near a port it will have fuel contaminants, but you would hope it is harvested elsewhere but then they don’t label where it comes from. Here “free range chicken” means that thousands of chickens are crammed into one large pen instead of hundreds of small pens! This doesn’t mean that you or a lot of other people don’t have a B Vitamin or other chemical deficiency that contributes to depression. Most of my bipolar symptoms were alleviated by taking Lithium; I have looked into the possibility that ‘people like me’ have a lithium deficiency to start with. There are old studies in which it was suggested that Lithium be added to city water systems in areas where Lithium was deficient and tentatively linked to depression in the community. No one as far as I know ever followed up on such “clues” – too simple, I suppose. We wouldn’t want a mineral to solve a mood disorder; where’s the profit in that? If I have only been B Vitamin deficient and taking folate is the solution, I am over the moon. A truly simple solution. I hope however it is not a placebo effect and that I will revert back to the way I was. I love this feeling of clarity. But folate is the only change to what I have been doing. So I conclude that folate is the answer for me. Ask me six months from now the same question and hopefully I will have the same answer. Lithium I don’t know too much about. Apart from the fact that it alleviates bipolar symptoms. I always thought I was low in K or Mg. So I eat lots of bananas! It’s my go to fruit.